Several of my restaurant customers asked me about Wine Pairing with pears. They asked because they knew I like both. Instead of simply telling them what I like or like to do, I used the opportunity to invite them to a tasting. I told them I’d sponsor a tasting at the restaurant if they could gather about 20 people who would like to participate. They brought me a list of 30 people the very next day! Food and wine pairing is a really fun thing to do. We are very fortunate to have a huge variety of wines, cheese and pears available today. This is the actual program I used for that wine tasting. Not only did I include wine and pears, I added cheese, much to everyone’s approval. Bartlett pears (also called Williams Pear) are probably the most common pear available in the U.S., so I started with it. Bartlett’s are very juicy and aromatic. They have a smooth texture. I decided to pair the Bartlett with a richly decadent triple cream cheese: Brillat Savarin from Normandy (one of the richest cheeses you will ever taste). It is very smooth and buttery and a complement to the sweet, juicy Bartlett. The subtle cheese flavor is ideal next to the aromatic pear. I offered this cheese with some crusty bread to spread the cheese on, a generous slice of the Bartlett and married them with a glass of dry, toasty Brut Champagne! We were off to a great start. Before leaving the Bartlett behind, I asked my guests to try a taste of nice Merlot with it and some Fontina cheese. Fontina is best noted as a savory and fruity table cheese but is excellent when cooking certain recipes. This tasting was very different from the first, but again, very pleasing. The Merlot I served had a little chocolate and a touch of cherry taste. Very smooth with a bold finish. The Red Bartlett pear I matched with some excellent Brie and grand reserve Chianti! 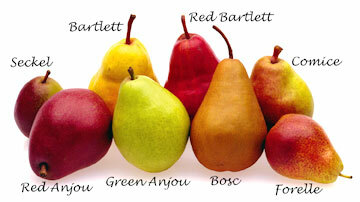 A Red Bartlett is a mild tasting pear with a soft, aromatic aroma and flavor. Brie is a mild cheese with a very creamy texture. Brie has a slightly nutty flavor that gets stronger with age. Brie is the most prized and celebrated of all French cheeses. Camembert is a classic soft, white-rind cheese, similar to Brie, so you could substitute it if you wish. You could also try tasting the Red Bartlett with some Stilton Blue cheese and a bit of Port instead of Chianti. Yummy! Next I brought out sliced Anjou with some goat cheese and some Sauvignon Blanc. One of the things I like to do is NOT tell my guests what kind of cheese they are tasting until afterwards. I knew some of my guests had never tasted cheese made from goat’s milk so I kept mum until they told me what they thought. Nearly everyone approved of the cheese, pear and wine combination. Anjou is a sweet and juicy pear with a very good pear aroma. I teamed this pear up with Chevagne from Belgium. Chevagne is one of Belgium beauties. It is a surprisingly mild and creamy goat’s milk cheese. The wine I served with this combination had a clean herbal flavor with a definite taste of grapefruit. Although I didn’t offer this at the tasting, I can tell you that an Anjou pear is wonderful with Brie or Camembert and a not too dry glass of champagne. The Bosc pear slices were served with a delicious white cheddar cheese which has a bold, nutty flavor and a somewhat grainy texture. A Bosc pear has a spicy sweet taste that can hold its own with this particular cheese. The Cabernet Sauvignon I served with this combination was a bold, fruity wine that complemented the pear and cheese wonderfully. I then served the Bosc slices with some Parmesana Reggiano and some dry Riesling. Of course, my guests liked this team as well. Comice is the sweetest of all pears and a bit heavier in texture. It's an especially good dessert pear with full-bodied flavor and so I served it with some more Stilton Bleu cheese. Stilton is a strong bleu with a salty and grainy texture. Several of my guests said they didn’t like strong cheeses and were reluctant to try the Stilton. After a little encouragement, they did and most (not all) said it was actually pretty good with a piece of Comice and (a lot?) of the Port I served with it. 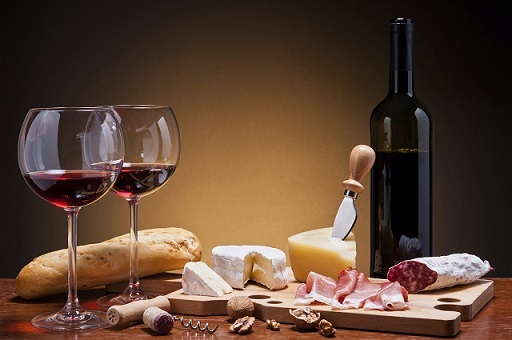 Port is a rich wine with ripe berry flavors and it works well with the stronger bleu cheeses. I brought out some Roquefort for those who wanted to taste the difference. Forelle pears are small but very juicy with a mild, sweet flavor. Even when ripe, the pears keep a crisp texture. Oka Classique is a Canadian cheese I like very much. The original recipe was brought to Canada (Oka, near Montreal) by Benedictine monks. Similar in style to Port Salut, many prefer the less rubbery texture and more interesting flavor of Oka. Oka is mellow, smooth, creamy and a little bit nutty. However, it does tend to have a strong, pungent aroma that intimidates some people. As an alternative, I offered my guests some SAFR Port Salut, a semi-soft cheese with mild, nutty flavor and a creamy texture ...a nice complement to the pear's juicy flavor and crisp texture. I again served some Dry Riesling, a fruity wine that blends very well with the mild pear flavor and the nutty flavors of the cheese. The dry finish of the Riesling prepares your palate for the next delicious bite of pear and cheese. This pear and the Riesling (or a Late Harvest Riesling) both go well with Maytag Bleu (blue) cheese as well. Seckel pears are a good reason to have some Pinot Noir wine with a semi-soft cheese like a Fontina or Havarti cheese. Seckel is the smallest regional variety; a very sweet and very juicy pear. Pinot Noir is a medium body wine with fruit tastes and a soft finish. You can taste blackberries and it has an aroma of flowers. The combination is great. There you have a complete wine pairing with cheese and pears. I must tell you, when I am asked to do these types of events, I always check my research with local cheese and wine experts. In fact, these folks are usually glad to assist with (sponsor) such events. As far as where I buy the specialty cheeses I need, I can usually find them locally at the grocery store or sometimes at the local Farmer's Market. Check out the Beer Article for another fun food pairing idea. 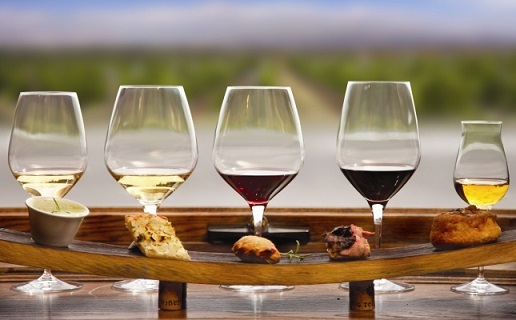 Enjoy your wine pairing experiences and the company of those you share them with.